A considerable amount of software requires the disk operating system known as CP/M. Originally developed in 1973, it has since become an essential part of many word processor, accounting, data base manager and other commercial software products. CP/M means "Control Program/Monitor" and was intended for use with the 8080 and Z80 microprocessors. 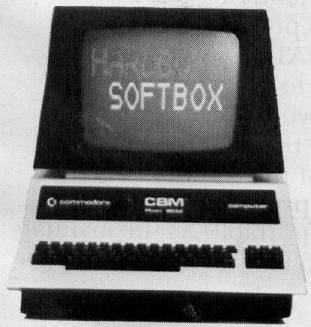 "SoftBox," manufactured by Small Systems Engineering, however, allows you to use CP/M-based software packages on the PET/CBM computers. Attached between your PET and disk drive, this "interface-computer" contains 64K RAM, a Z80 chip, IEEE and RS-232 interfaces with software-definable baud rates, and a Corvus hard disk interface. The unit will work with any PET/CBM using Upgrade or 4.0 BASIC and 8K RAM. An optional cassette program can be used with Original PETs. Any combination of from one to eight Commodore floppy disk drives (2040, 3040, 4040, or 8050) may be attached, resulting in up to a potential eight megabytes mass memory available at one time. Memory can be further increased by attaching Corvus hard disk drives. A total of 80 megabytes is possible. Adding CP/M to your PET takes only a few minutes. You plug a standard PET-to-IEEE cable between the SoftBox and your disk drive. (Another of these cables goes from the drive to the PET.) When you power-up the three units, everything is normal and, in fact, you can work with the computer and the disk drive as if SoftBox were not connected. For CP/M, you place the supplied disk (CP/M Version 2.2) into Drive zero, LOAD, and RUN it. That's it. PET is now under the control of CP/M. The disk contains a variety of CP/M utilities, special Corvus files, and a SoftBox memory test diagnostic program. If you've not worked with CP/M, the SoftBox User's manual is an excellent introduction. It takes you through the major CP/M commands, step-by-step, and clearly demonstrates their uses and terminology. Special commands allow you to control the PET screen (upper/lowercase, graphics/text), the TI$ function, and, when you want to return to normal PET BASIC, simply type "cold" and you're back in the Commodore. And for the more advanced user, several appendices provide technical information, a map of SoftBox's memory, suggestions on modifying CP/M itself, and I/O details.